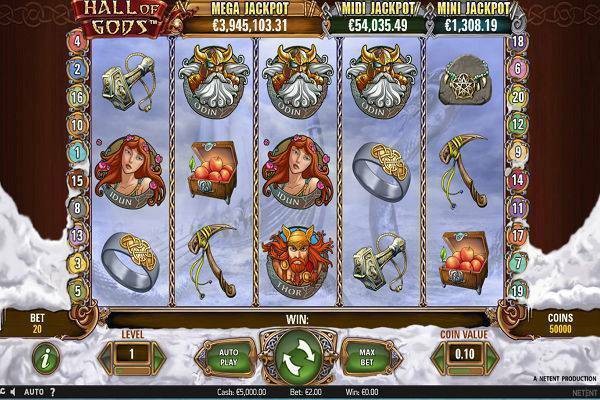 Hall of Gods is a 5 reel 20 payline jackpot slot with a theme based on Nordic mythology. It’s well drawn, and got a few bonus features up its sleeve to keep the coins flowing in. The RTP is 95.5%, which isn’t all bad for a progressive jackpot. But let’s get to the point. Hall of Gods is one of those mega massive progressive jackpots from NetEnt that regularly pays in the multi-millions. Even the smallest win was well over £544k. Every single jackpot hunter knows this game. If you’re aiming to strike it rich, then you can give Hall of Gods at one of these recommended casinos. To set your bet size in Hall of Gods, start by adjusting Coin Value at the right side of the screen, and then adjust the Level, which is the number of coins you want to bet per lin. The 20 paylines are active at all times, so there’s nothing else after that and you’re ready to hit spin. Minimum coin size is just £0.01, which means your smallest bet size per spin is £0.20, since you’re betting on 20 lines all the time. All in all, pretty good for a jackpot game. You’ll recognise these symbols quickly as they have those words written on them! So let’s get to what Hall of Gods is really about. The progressive jackpot. You already know it’s bloody massive. But how do you win it? Well, actually there are 3 progressive jackpots attached to this game: Mini, Midi and Mega. Obviously Mini is the smallest, Midi the in between, and Mega is the biggest one and that’s probably the one you want to get. But to get to any of these jackpots, you need to get into the bonus game first by spinning 3 Bonus symbols. It’ll open up a new game screen where you’ll get a hammer to smash some shields. It can reveal cash prizes or one of the 3 jackpots. Once you get 3 matching jackpots, then that jackpot is yours! Expanding Wild: The Wild symbol not only substitutes for other symbols to form a payline (with the exception of bonus and scatters), but when it lands on the 3rd reel, it will also expand to give you an entire reel of Wilds. Free Games: Spin 3 or more Scatter symbols, and you’ll trigger a round of free spins. 3 Scatters get you 10 spins, 4 Scatters get you 15, and 5 will get you 20 spins. Not only are there free spins, but during this round, all wins come with an extra 2x multiplier. Even better yet, free spins can be retriggered. Hall of Gods is a carefully and beautifully, hand-drawn game. Although there are no flashy 3D animations, this game is still aesthetically pleasing and has withstood the test of time. The style gives it a true old world, mythology feeling, and the expanding wild dragon is an impressive sight. Players hunting for big jackpot fortunes all know Hall of Gods. It’s one of NetEnt’s most famous progressive slots and it pays out very generously in the millions. While the multi-million mega jackpot won’t be so easy to clinch, there are smaller progressive jackpots that can land you a few grand, plus free spins and multipliers to keep your bankroll happy. Feel the Nordic gods smiling upon you and give Hall of Gods a spin at one of these online casinos.